A move to reduce the speed limit on a stretch of motorway in Sheffield to reduce pollution has sparked debate among motorists. Highways England has reduced the speed limit from 70mph to 60mph on the M1 between junction 28 for Mansfield and junction 35A for Stocksbridge. A new speed limit has been introduced on a stretch of the motorway. in a bid to cut pollution levels. 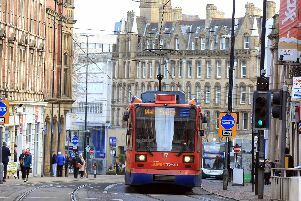 The decision has sparked debate among Sheffield Star readers, many of whom have taken to Facebook to make their opinions known. A number of drivers suggested adjusting the sequencing of traffic lights to improve flow would be a better option instead of imposing a speed limit. Sarah Beauchamp said: “They should think about looking at some of the light sequences and running of the roads to keep traffic moving rather than trying to stop it. “Traffic at a stand still causes more pollution. Stephen James added: “Absolute nail on head Sarah, was just going to post the same. “No point faffing about with the motorway speed limits given the shocking sequencing of the lights in the city. “I travelled through from Ecclesfield to town on Saturday at 11am, no match day traffic to worry about and it took forever.